It's too bad that only one part of this recipe is actually good and worth making: the pumpkin seed sauce. 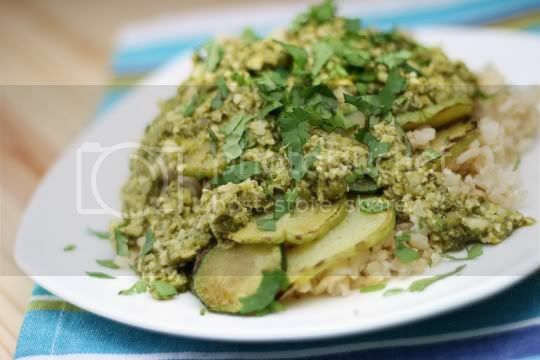 A sort of unique Mexican take on pesto, it's served atop sauteed veggies and a base of brown rice. In the end, the item with the most flavor and deliciousness is the sauce...so just save yourself the effort and make that! Beware! This recipe as written is time-consuming and seemingly contains a few errors. 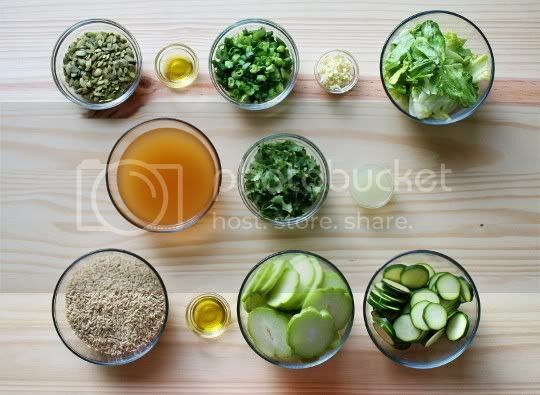 There are three major components here--the sauce, the veggies, and the rice--that take a lot of time, so time management is key (along with the recipe changes I'll suggest below). First, I'd say make the rice just to get that out of the way. Just cook your standard brown rice. In fact, if you have any leftover rice, you might just want to use that; the rice is in no way supposed to stand out here, it just serves as a base for the other parts. Also, you may want to halve the amount called for in the recipe; 2 cups dry yields a LOT of cooked rice. Next, make the sauce. Toast pumpkin seeds (aka pepitas) until golden. I actually didn't have the full amount called for in the recipe (2/3 cup), so I added maybe a couple tablespoons of pine nuts. Of course, I didn't see the recipe note saying that walnuts could be used instead, but the pine nuts worked out fine. Then, saute green onions and garlic. Recipe error #1: the recipe calls for 12 green onions (or 1 cup). I used about 8 green onions, but that still equaled one cup (the recipe also doesn't state to use the green or white parts or both, I used both). However when this amount cooks down, you're supposed to add 1/2 cup of it to the sauce. Unfortunately, my entire cooked down amount equaled about 1/2 cup, so I just added 1/4 cup instead (the other half goes to the sauteed veggies). So I'd suggest doubling the green onion and garlic amounts. In a food processor, add the nuts, green onion mixture, lettuce (weird right?! ), cilantro, and vegetable broth, and puree until smooth. Well, it won't be entirely smooth, but it will have a slightly chunky, slurry-like consistency, similar to pesto. Add the puree to a small pot, and simmer for 15 minutes, adding lime juice and seasoning at the end. If you wanted to make this into more of a pesto, you could probably substitute the broth with some olive oil and omit the cooking step. The final step is making the sauteed veggies. Recipe errors #2 and 3: the recipe calls for "medium-size" chayote and zucchini (chayote is a Mexican squash, kind of like a cross between squash and green apple in taste and texture). Ugh, this is such a pet peeve of mine...WTF is medium size??? Anyway, I think I used entirely too much chayote; also, the prep method is odd. Slicing the zucchini is okay for size and cooking purposes, but the chayote is too big and clumsy. If you don't have a big enough pan, the mass of veggies won't cook evenly and will take almost double the suggested time. To make things easier for both cooking and eating, I think diced veggies would work a lot better. They'll cook faster and more evenly, and be easier to eat in the final dish. If you want to stick with slices, I'd suggest cutting the chayote amount down and also cooking it separately from the zucchini. I ended up having to fish out the zucchini slices that were properly browning in order to get the chayote cooked and browned enough...and it takes a lot longer to cook than the zucchini! Also note, the chayote doesn't really shrink in size...you've been warned! So after all is said and done, the final dish is good, but it's the sauce that's the star here. It's light, tangy, and fresh, but also slightly rich from the nuts. It has a strong herbal punch from the cilantro, and lots of garlicky flavor. In fact, I think this would even be good as a dip for chips. The veggies are good, just your standard sauteed stuff. 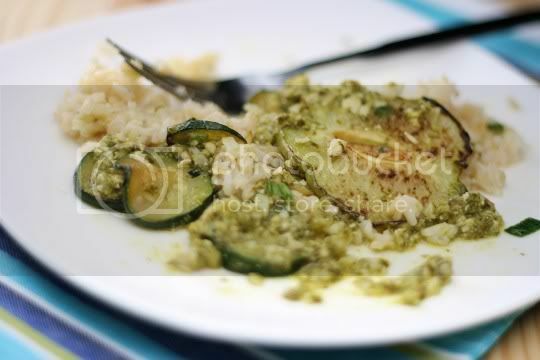 The chayote and zucchini are sweet and juicy, with a delicious browned flavor. Everything eaten together is garlicky, pungent, sweet, and tangy. Even the textures are varied: firm and juicy veggies, chewy rice, and a bit of crunchiness from the sauce. Make again? The sauce, yes. Everything else, no. But surprisingly, the dish keeps pretty well for leftovers.